If you need to bind your next arrangement, why not try some Bouillon crinkle florist wire? It provides a different look to standard wire and comes in a wide variety of colours. Use Bullion wire to decorate your wedding flower bouquet and fresh flower arrangements, event flowers and wedding flowers. 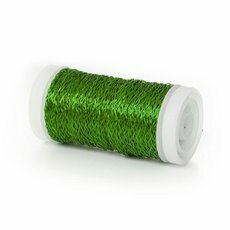 Coloured Bullion wire is a soft crimped wire that comes in great fashion colours and is used to enhance your floral designs. Bouillon crinkle florist wire comes in a zigzag shape and has long been a favourite for various craft and floristry projects. It can be used for binding work, fine wiring detail or decorating floral designs. It also has applications in scrapbooking and jewellery making, so it is very versatile. The Koch & Co bouillon crinkle florist wire is 28-gauge crimped metallic wire that comes with 459ft on each roll. It is available in silver, aqua, hot pink, lime green, black, gold and red. Use bullion wires to hide your binding work and/or as for finer floral arranging detail and add accents to wedding corsages and event decorating. Try our Bouillon crinkle florist wire on your next project.